Lawful Islamism is a radical and supremacist interpretation of Islam that seeks to incrementally destroy Western society from within and replace it with a Sharia-compliant theocracy -- culturally and politically rather than violently. Methodically and patiently. With words not bullets. Activism not bombs. 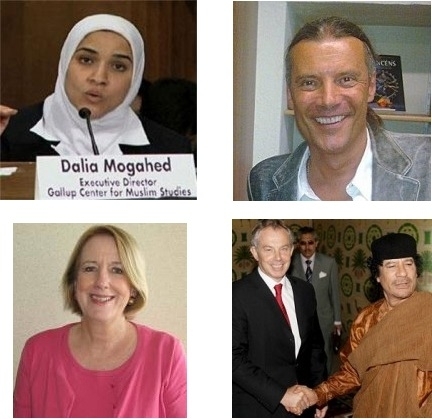 Clockwise, from top left: Top Obama adviser Dalia Mogahed has had enough of Syrian Dictator Assad, but only because he can no longer lead "resistance" to Israel; Profile in Courage – Swiss MP Oskar Freysinger gave an impassioned speech defending Western values against Sharia creep; Profile in Cowardice – former UK PM Blair wants everyone to know he reads the Koran "everyday"; Hillsborough County, Florida school board president Candy Olson thinks it's a wonderful idea for your kids to learn about Islam from officials of Hamas-linked CAIR. "Offering $1,000 Reward, Group Battles School Board over Muslim Outreach," by Kenric Ward. Sunshine State News, April 3, 2012. (Under the guise of multiculturalism, the children of Hillsborough County, Florida are learning all about Islam from officials of Hamas-linked CAIR. This is a good thing, according to the school board president: "Tapping into the resources of our community enhances the educational experiences of our students and enables teachers to bring lessons alive with guests who bring valuable knowledge, skills or experiences to our students." "... students are routinely exposed in their classroom to new information and opinions, hence they tend to be more receptive to new beliefs and ideas. Learning institutions are therefore fertile grounds where the seeds of Islam can be sowed inside the hearts of non-Muslim students. ... We should use every opportunity presented or created to sensitize non-Muslim peers and school staff with Islam and establish an environment in which every where a non-Muslims [sic] turn, they notice Islam portrayed in a positive way and get influenced by it and eventually accept Islam with Allah's guidance, insha Allah." (Emphasis added). "BBC refuses to screen play about Islamic threat to freedom of speech," by Tim Walker. The Telegraph (UK), March 28, 2012. (The BBC's Director-General, Mark Thompson, refuses to give airtime to Can We Talk About This?, the National Theatre's examination of how Islam is curtailing freedom of speech. This is not a parody. Thompson previously conceded that there is "a growing nervousness about discussing Islam" at the BBC).